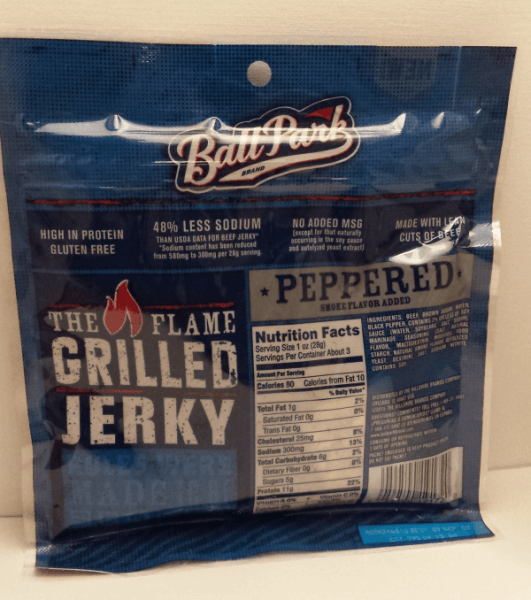 If you’re on the lookout for a new snacking option that’s filling and high in protein but doesn’t go bad quickly or require refrigeration, check out Ball Park’s newest product line. Their Flame Grilled Pork and Beef Jerky products taste fantastic and make terrific on-the-go munchies for kids and grown-ups alike. They also offer several unique qualities that set them apart from other beef jerky products on the market. You don’t see new brands of beef jerky very often, and many people are put off by the usual offerings. Standard beef jerky fare tends to taste quite salty, and many are so tough to chew that you’re afraid you’ll break a tooth on them. Ball Park fries their jerky first, then flame grills it for a moister, more tender texture than most other jerky brands. This helps Ball Park The Flame Grilled jerky options avoid tasting like salted shoe leather as some brands do. They also contain significantly less sodium and fat than their competition. 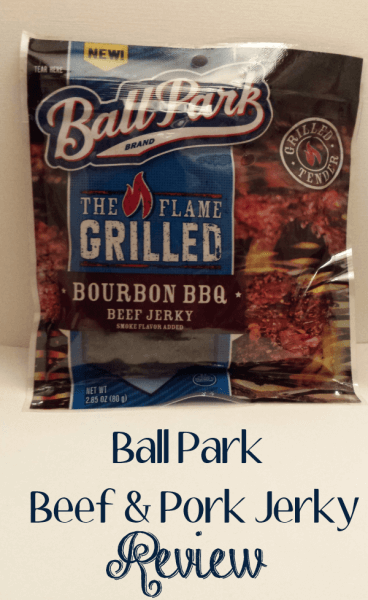 Nutritional information on the Ball Park jerky is based on each 2.8 ounce packet containing approximately three one-ounce servings, but keep in mind that most people will eat at least two-thirds of a packet, if not the whole thing. 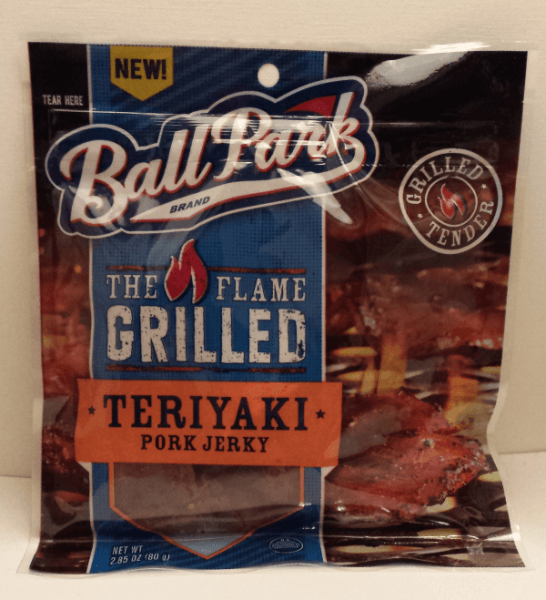 I can’t recall trying pork jerky before, but I love bacon, and Ball Park pork jerky reminds me of bacon with some additional flavoring. The Teriyaki pork jerky offers a chewy texture with just a hint of sweetness. Each serving contains 2.5 fat grams, 8 grams of protein, 90 calories and 7 carb grams. 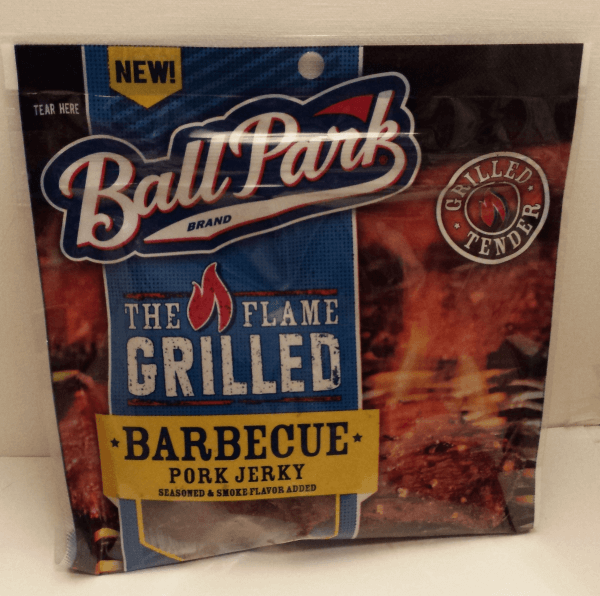 The Flame Grilled Barbecue pork jerky boasts a slight barbecue twang and also has just 90 calories per serving. It contains 3 fat grams, 10 grams of protein and 6 carbs. Ball Park The Flame Grilled Original beef jerky tastes kind of like standard jerky but not as strong in flavor and less salty. It’s also much less tough, and, like the other Ball Park jerky products, lower in calories and fat that you’d expect. It contains 80 calories per serving, with 7 grams of carbs, 11 protein grams and just a single gram of fat. The Flame Grilled Peppered beef jerky variety offers a peppery kick without feeling like it’s overly hot and spicy. It contains 6 grams of carbs per serving, 80 calories, 1 fat gram and 11 grams of protein. My absolute favorite is the Flame Grilled Bourbon BBQ beef jerky with its delicious sweet/tangy flavor and easy-to-chew texture. It contains 1.5 fat grams, 80 calories, 10 grams of protein and 6 carbs. I found it super challenging to leave some in the bag to share with family members in order to get their thoughts, and it went over well with everyone who tried it. 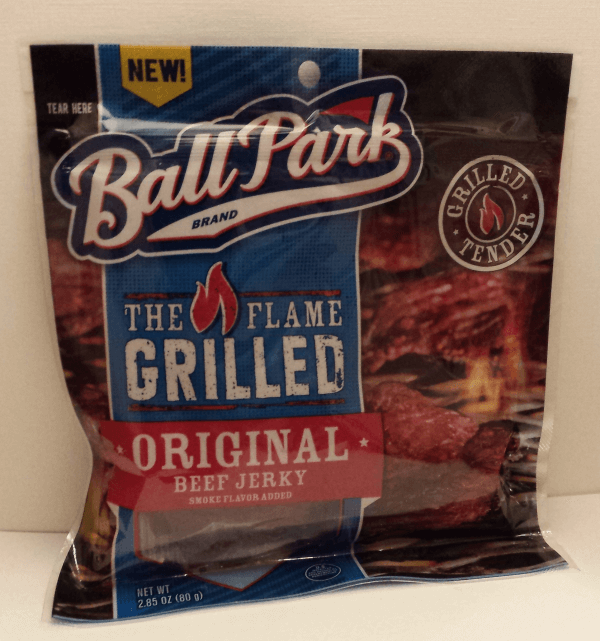 Ball Park The Flame Grilled jerky products contain 40 to 50 percent less sodium than the USDA averages for beef jerky. In addition, you’ll notice that you feel fuller for a longer period of time eating a high protein snack rather than chips, crackers or all high-carb snacks. 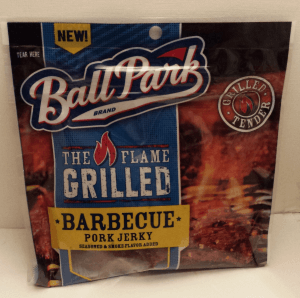 Ball Park’s new pork and beef jerky products mark the first time in the company’s 58-year history that they’ve strayed outside of the refrigerator and freezer sections. Their two pork jerky flavors retail for $5.99 each, and their three new beef jerky choices sell for $4.99. I received sample products to use for this honest evaluation. Where would you eat Ball Park The Flame Grilled jerky? Would you take some on a car trip? Add it to your family’s emergency food stash?